A startling look at how concentrated financial power and consumerism transformed American politics, resulting in the emergence of populism and authoritarianism, the fall of the Democratic Party—while also providing the steps needed to create a new democracy. Americans once had a coherent and clear understanding of political tyranny, one crafted by Thomas Jefferson and updated for the industrial age by Louis Brandeis. A concentration of power, whether in the hands of a military dictator or a JP Morgan, was understood as autocratic and dangerous to individual liberty and democracy. This idea stretched back to the country’s founding. In the 1930s, people observed that the Great Depression was caused by financial concentration in the hands of a few whose misuse of their power induced a financial collapse. They drew on this tradition to craft the New Deal. 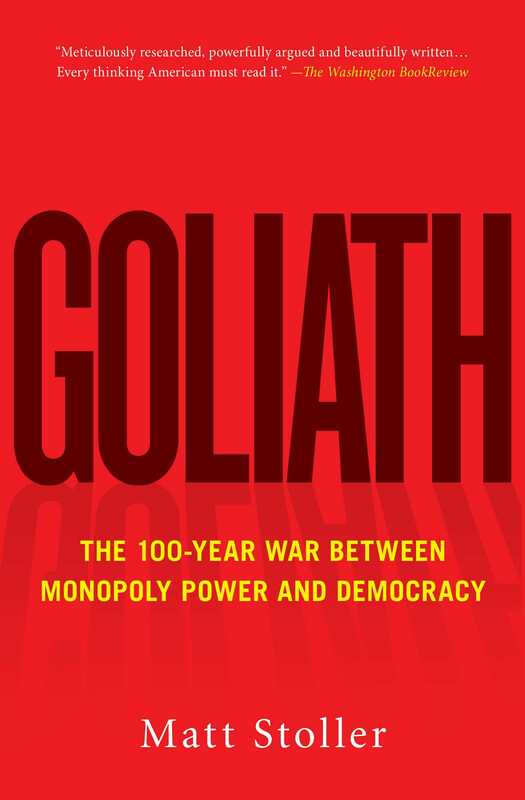 In Goliath, Matt Stoller explains how authoritarianism and populism have returned to American politics for the first time in eighty years, as the outcome of the 2016 election shook our faith in democratic institutions. It has brought to the fore dangerous forces that many modern Americans never even knew existed. Today’s bitter recriminations and panic represent more than just fear of the future, they reflect a basic confusion about what is happening and the historical backstory that brought us to this moment. The true effects of populism, a shrinking middle class, and concentrated financial wealth are only just beginning to manifest themselves under the current administrations. The lessons of Stoller’s study will only grow more relevant as time passes. Building upon his viral article in The Atlantic, “How the Democrats Killed Their Populist Soul,” Stoller illustrates in rich detail how we arrived at this tenuous moment, and the steps we must take to create a new democracy. Matt Stoller is a Fellow at the Open Markets Institute. Previously, he was a Senior Policy Advisor and Budget Analyst to the Senate Budget Committee. He also worked in the US House of Representatives on financial services policy, including Dodd-Frank, the Federal Reserve, and the foreclosure crisis. He has written for The New York Times, The Washington Post, The New Republic, Vice, and Salon. He lives in Washington, DC. Goliath is his first book.